In our Tuesday evening discussion group a couple of weeks ago, there was a lot of concern among our Anglican friends on how to express the Christian religion in terms comprehensible to the current culture. I listened with much interest and empathy, and I didn’t have any answer for them. Finally I asked Demetrios, yes, aloud and in front of them, “How is it we Orthodox don’t have this problem?” And he answered the question very well, I thought. He said it’s because Christianity is not geared toward any given culture, but is according to human nature. Christ is universal, catholic, meaning for all people in all times in all places. Who doesn’t need to be loved, and who loves us as He does? Who doesn’t need peace in his soul, and who guides our feet into the ways of peace? Who doesn’t need his past forgiven, his present joyful and his future filled with “sure and certain hope”? What human being doesn’t feel in his soul that death is a monstrous wrong, a cruel end, the ultimate enemy? What need has any of this to be put into specific cultural terms? And the corollary is, it’s a tautology, a redundancy, to say salvation is only through Christ. He is the very definition of salvation. We went to Ely Cathedral, tons of photos here, about half an hour from Cambridge, and well worth the trip. Its saint is St. Queen Etheldreda. It’s a beautiful cathedral, but what cathedral isn’t? We have been into so many churches and cathedrals in the last few days that they are all blurring into one in memory. Ely, though, is prettier than most, in my opinion. From there we went to the tiny village of Hawstead, where we had arranged to meet Demetrios’ Old Friends Richard and Pamela. They live on a little road where most of the houses have names instead of numbers. So we drove by three times, trying to spot the house labeled, “Jasmin”. Finally, Richard came out and flagged us down. Demetrios met Richard and Pamela one night as he was having supper alone in a restaurant. He was wearing his Air Force uniform, and Richard and Pamela always feel, they told us, a certain admiration and respect for American servicemen. (That’s a legacy of World War II.) And this major looked so lonely! So they stopped to talk to him, and eventually sat down at his table, and thus this long friendship was born. Pamela makes bobbin lace. As I love lace, I asked to see how it was done, and she brought out her latest project, a mat still in progress. It’s so intimidating! This particular piece uses 68 bobbins! I don’t know how she ever knows which bobbins to use or which of thousands of pins to wrap the thread around. She did explain it more than once, but I was lost. I bow to people like her who can do such beautiful things as that! I shall never have enough patience. We went to "The Round Church" in Cambridge, whose proper name is the Church of the Holy Sepulchre. It is modelled after the church of the same name in Jerusalem, even has a sort of Pantocrator up high in the ceiling of the tower. It is no longer used, at least not regularly, for worship; its congregation has merged with another and their church building is used. This building is now operated by something called the Christian Heritage. This group has made the church building into something of a museum of Christianity, showing the history of Christianity in Cambridge (and in the UK). Did you know Christianity came into Britain with the Romans? In fact, St. Constantine was made emperor in - guess where? - York! In other words, in those days, the Brits were o/Orthodox Christians. Then Christianity died out when Rome fell and the Saxons took over. People reverted to paganism, except in Wales and in Cornwall, where they clung to their Christian faith. Later, of course, Catholicism came to Britian, but that was a distinctly different thing. There's a 23-minute film you can watch that tells you about many great men who were Christians. It concludes that still today, many people find Christianity meaningful, even transformative, in their lives. It took me until that night to figure out what it was that bothered me so much about all this. Finally, it hit me: these people are presenting Christianity instead of Christ. They are defending the Church instead of bringing people into relationship with the Lord. Contrast what they are doing with St. Paul's description of what he was doing: "And my speech and my preaching [was] not with enticing words of man's wisdom, but in demonstration of the Spirit and of power." He demonstrated the Spirit and showed them God's transformative power. Brought them grace and love and power and liberation. That's what these people no longer know how to do. And I think it was in the same church - but we've visited so many I am no longer sure - that we saw the base of the baptismal font encircled with stuffed animals and other toys, by way of decoration. Talk about trivializing Holy Baptism! It's very sad. The very ploys they contrive to attract more people are driving them away more than ever. Demetrios says that, having lived 7 years in Cambridge, he gets to missing it every once in a while. So, although we went there two years ago, we came back again. Of course we made the same mistake as last time, coming on the August Bank Holiday weekend, every highway and hotel crowded. Next year we shall take careful note of all bank holidays. This year at least we are better drivers than before and we do have maps this trip. Things are improving. Gradually, as you shall hear. 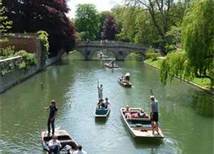 We also had the sense this time to book our hotel in advance; we got a good deal on the Arundel House Hotel, right on the River Cam and less than a 10-minute walk to the town center. It's fully modern but with traditional, cozy decor and unusually comfortable beds. You sink in, yet get good support under all the softness. We can certainly recommend this hotel! We came first to Clare College, where I asked the portress to explain to me how the various colleges related to the University. Turns out each college is an independent unit, both academically and administratively. Their subjects overlap, and each is in competition with the others for the best faculty, students, etc., etc. ("The richest is Trinity College," she said, "by far. I know because I worked there twenty years.") There is no actual entity called "Cambridge University"; it's just a name for all the colleges collectively. We had a good look at Magdalen College; see a host of images here. It's medieval and gorgeous. We struck up a great conversation with the porter, and he ended up giving us an insider's tour. We got to see a room I suppose I'd call the faculty lounge, but a place where the fellows can meet and relax by the fire and chat over their tea. It was built by the monks who founded and built the college. The contruction inside is of timber, with hardened clay in between the posts. The monks appear to have taken sticks to the wet clay and drawn simple designs in it. Simple designs, but repeated over and over again with a tiling effect, they give the overall impression of being very complex. On the porter's recommendation, we went into the Pepys Library. Samuel Pepys (pronouned "Peeps", in case you have forgotten, high school having been quite long ago) donated his library to the college. It contains all his books and only his, he having forbidden any others to be added. They are stored in bookcases he himself designed, and an interesting thing about them is that they were among the first to store books upright. Before that, books were usually stored lying flat. These were among the first uses of glass in book storage. For aesthetical reasons, Pepys wanted his books arranged according to height, so the books on any given shelf were of similar height, instead of being arranged by subject. This of course meant books on any given subject might be scattered among several cases, which in turn necessitated a careful catalogue. Pepys was a pioneer in the cataloging of books. And what books! They are bound in tooled leather, tooled in gilt, of course. Pepys was the embodiment of the man of encyclopedic knowledge, interested in virtually everything. There is a compendium of all the cargoes aboard the Spanish Armada. There are fantastic illuminated manuscripts. There is a book containing a signature of Sir Francis Drake on the fly leaf. 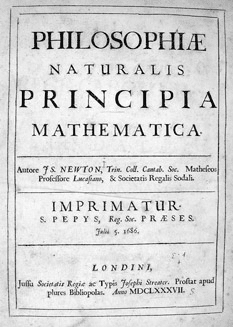 And my own favorite, a first edition of Sir Isaac Newton's Principia Mathematica! Looks whose imprimatur is on it. And of course there are his famous diaries, the ones you studied excerpts from in school. In the chapel of Magdalene College, there are several copies of the Book of Common Prayer (a rarity in iteself) laid out in the choir, and their publications dates, as we found out by opening them, were all inthe early 1700s! After lunch, we walked around and Demetrios had a wonderful time finding a shop where he once bought a tie, a pub where he once had a drink, a book shop from which he had once bought a book. "It's sort of healing, in a way," he said. In the big bookstore, Demetrios asked about a book he'd been wanting for years. The man with the computer at the information desk said it was out of print and thus impossible to get. We had a look, though, at the books being sold in the open-air market, and wonder of wonders, there was the very book, staring up at us! While we were standing in the bookseller's tented stall, quite suddenly we had the hardest rain I've ever seen except for the time we were in a tornado - or were very close to the tornado, at any rate. I've never seen any such rain in England, complete with lightning, thunder, and hail bigger than peas. We remembered what the weather man had advised the night before on the television: "If we approach the weekend realistically rather than optimistically, we shall not be disappointed." !!! However, what they say here is true: if you don't like the weather, wait half an hour. So we did and the beautiful day, so violently interrupted, resumed. We watched some people punting in the river, exactly as gondoliers do in Venice. When we were tired from walking, we switched to driving. We drove out to the Air Force base at Lakenheath. Demetrios used to practice neurology (his other specialty) in the hospital there. It's an American base, although ostensibly still English. Instead of being called AFB Lakenheath, it's RAF Lakenheath. It's about a half-hour's drive from Cambridge. Of course they didn't let us in. There was another case of needing to be realistic instead of optimistic. We're living in the post-9/11 world. But it was worth a try. We didn't see any of the fighter jets, either. We heard several of them taking off. We ate supper at a pub Demetrios remembered, near the base, the Olde Bull Inn. It has since become a very posh and place. Despite its price, the food has nothing special to recommend it, although there wasn't anything wrong with it, either. There was a wedding party in progress. The little ring bearer, who immediately ran up to inspect me, was wearing a fancy shirt and shiny vest above his nappies and bare feet. The bridesmaids were lovely in their rose gowns. The bride was a large woman with dark hair worn up. She was wrapped in layers upon layers upon layers of white, enough to have accomodated her plus a Volkswagen without anyone even noticing, and sporting a stylish tattoo on her shoulder. She came up to the bar and, leaning on it with one elbow and placing the other hand on her hip, began loudly conversing with some of the other patrons standing nearby. We never saw the groom. Coming back to Cambridge, we became confused and, well, let's just say that in the very long process of finding our way, we met a perfectly lovely English couple who live in Hong Kong but, like us, summer here. Together with the owner of a Chinese restaurant (long story), they helped us with directions and thanks to them we arrived safely back at our hotel. I think we owe the Chinaman to patronize his restaurant while we are here. (Theoretically we can find it by simply following his map in reverse.) Such kind people, all, and they were free with their sympathy, too, along with their help. Today another of Demetrios' long-held dreams came true. We received a telephone call from his long-lost friend, John Coventry. John is the one who first brought Demetrios to England, and his father is the one who found Demetrios his first job, here in Ormskirk. It turns out this most joyous re-connection came about as a result of our recent excursion to Crosby. We found the Coventrys' house and left a note to the new occupants, asking for their help in finding any of the Coventry family. They knew how to get in touch with Roger, from whom they had bought the house, and he passed the word, without telephone number, to his brother, John. We're going on our delayed trip to Cambridge after all, so we won't be able to see John (and his wife!) until we get back, but we are so excited!! Rejoice with us! Few things in life are better than finding old friends. We went right back to Lytham the very day after we'd first been there. This time, the very first thing we did was visit the windmill, and it’s a good thing we did, because it closes for an hour an a half at lunch. It was interesting, as any windmill must be, but the most interesting feature was the old man downstairs who was the guide. He had so many stories to tell us of how life in Lytham used to be. 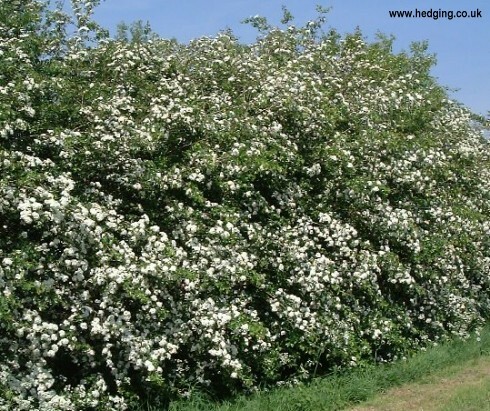 He told about the time he picked some white hawthorn on his way home from somewhere, to give to his mother. She was terribly displeased! “Get those out of this house!” she cried, “Out, this minute! They’re bad luck!” And she herself took them out to the back and stomped all over them. Years later, our guide thought to ask her what that had been all about. Turns out that until sometime in the 1890s (I think he meant until 1829? ), Catholic worship was still illegal in England. “Technically,” said our guide, “a Catholic caught hearing mass could be drawn and quartered.” So the priests used to go about secretly. When a priest came to town, the word would quietly spread among Catholics. The Catholic children would pick white hawthorn and bring it with them to mass, to lay upon the altar. Apparently, white hawthorne was one of the first plants to blossom. (Also, there is a lot of folklore connected with it.) Eventually, the police caught on, realizing that to catch a priest, all they had to do was follow children who were carrying white hawthorn. So that flower, he said, has been bad luck in England ever since. Our guide also explained why taxis in Lytham all have a tag in the back that reads, “Hackney Carriage.” A hackney carriage is, of course, a horse-drawn vehicle. It seems some women’s group back in the days of the hackney carriage were concerned that the horses weren’t being fed or watered all day long. So they lobbied and a law was passed that a hackney carriage had to carry a bale of hay and some water for the horse. That law has never been repealed, so it makes a good excuse for stopping or even arresting a cabbie if you think he has broken some other law, but you can’t prove it! “There are some very strange laws still on the books,” concluded our guide. He had so many other tales to tell that we were there until closing time, listening. On our way back to the car, we passed the White Church again. This time, to our delight, we saw a bride and groom standing outside it. So we waited, behind the hedges, until they got into their limousine and drove away, then we raced to the door of the church. Sure enough, it was still open, and Norma, the verger, was still inside. Hurrying toward us, she asked whether we’d like a look around. When we said yes, she gave us the tour. The congregation, Norma told us, is a combined one, Presbyterians and Congregationalists united. The very tall tower of the church doubles as a lighthouse at night, warning ships away from the mudflats. Two of the stained glass windows were of special interest to us. One commemorated the Pilgrims. It showed various Puritan heroes, and the biggest pane showed the Mayflower The man who organized the voyage of the Mayflower was also depicted. (These people use stained glass instead of icons.) I was doubly interested in this, as three of my ancestors, the Allerton family, were aboard that ship. The other most interesting window, for us, was the Martyrs Window, showing various Reformation martyrs. The biggest picture of all was of Martin Luther, never mind he was not martyred. Then there were others, beginning with Savonarola. But, for a sign of hope, one little section of the window depicted the Statue of Liberty! Norma offered us tea, but as we had just had lunch, we declined, with many thanks, and went our way. Towards Blackpool. Blackpool, in the 1960s, was the seaside vacation resort, in northern England, at least, more popular than Southport. It is, in the words of one Englishman, tatty. I’ve never been to Myrtle Beach, but perhaps that would be a comparison. Or Coney Island. Anyway, Blackpool, at least its tourist strip, is full of places with names like Pleasure Palace and Fun Fair. It has roller coasters, including a giant one, a Ferris wheel, and other carnival rides. It has attractions like the Haunted Crypt and the Tower Dungeon. It has horse-drawn carriages you can hire for a ride. There are penny slot machines, karaoke bars, tattoo parlors, girlie shows, shops selling magic tricks and jokes. There are plenty of places to buy fudge or hot dogs, and there’s a proliferation of chippies (fish and chips establishments). This strip goes on for two or maybe three miles, with a tram to carry you from one end to the other and all stops between. At night, the main drag is lit with all sorts of big, gaudy lights. The lights, I mean, are plastic figures like mermaids and Betty Boop, suspended above the street and lit from within. Brits, says, Demetrios, plan and save all year for their holidays. It seems to me that those who can afford it go to sunnier climes, especially Greece, Turkey, Spain, Italy, the South of France. Those who can’t afford to go abroad, especially young people and families with small children, go to places like Blackpool. Anyway, we were happy to see the place and happy to leave it. It was nine o’clock before we got home from a most successful day out. That’s the slogan on the sign welcoming you to the lovely little town of Lytham. As we had a series of fine days last week, we took to the road again, this time with Blackpool as our objective. On the way, though, we found Lytham, and because our friend Margaret has spoken so fondly of her childhood holidays there, we decided to stop and see it on the way. We ended up spending a whole, delightful day there. Lytham is full of quaint buildings, many Victorian, and some in the Tudor style, although I’m not sure they actually are Tudor. The town is full of flowers too; one banner downtown says it was a finalist in this year’s “Britain in Bloom” competition. We arrived at lunchtime. The outdoor cafés were all full, so we had our light lunch in a tearoom on the second floor of a place at the back of an upscale little alley. They had outdoor seating, too, on a terrace. After lunch, we admired the wares in three tiny shops in the alley, and bought a trinket or two for ourselves and a gift for Kim and James, who are expecting a baby next month. The beach in Lytham is much like other beaches in this part of the country: not very pretty. The water, of course is gorgeous, but it is very far away, with mudflats in between. Lytham used to have a pretty sand beach, but that was in the days when there was a dock for large shipping, when the shipping lanes were kept well dredged. Now the Ribble River, at whose mouth Lytham sits, has silted everything up, and except in spring tides, the water stays far away. All along the waterfront is a paved promenade, flanked by “The Green”, spacious lawns. And at one end of The Green is an old windmill. We went to see it, noted the “Open” sign, and decided, however, to sit and admire the sea for a few minutes before going inside. When we arose for our tour of the windmill, the sign was gone and the doors were locked. Disappointment! After having explored the high street quite thoroughly, and having had tea, we went to Lowther Gardens, because someone had told us they were lovely. Well, we never saw much of them, because we noticed a past-middle-age woman bowling. I had never seen outdoor bowling before, and it’s quite different from the kind we know in America. It isn’t tenpins. It’s one yellow ball, called the “jack”, which serves as the target. You bowl small dark balls (smaller than a grapefruit) at it, trying to hit it. The bowling balls come in sets of different weights. In competition, the winner is whoever puts his ball closest to the jack. This woman was very good, the more so because this grassy square was a “crown green,” meaning not level, but highest in the center, sloping gently outward in all directions, its shape changing the course of the balls. After several rounds, the woman said something deprecatory about her bowling, and we replied that she was obviously very practiced and very skilled. So that began a conversation that lasted half an hour, starting with answering all our questions about bowling. And that’s how we met Marlene and her husband Ken and their friend, Shirley. We liked them all very much and hope they will make use of the card we gave them with our addresses and phone numbers. As it was by now evening, we gave up on Blackpool and headed home. We went back again the next day! More to come. Our Tuesday night discussion group has reached Chapter 4 of Rob Bell's book, Love Wins. The provocative title of the chapter is "Does God Get what God Wants?" What He wants, of course, is for all to be saved. All. What stands in the way of His saving every last human being who ever lived? Human freedom - at least, potentially. The trouble is, if He were to override human freedom to "save" us, what He'd really be doing is the opposite: destroying us as human persons, reducing us to the level of a clever animal. So the very question is a kind of oxymoron, like, "Can God create a stone too heavy for Him to lift?" In Orthodox Christianity, we may not absolutely affirm that everyone will be saved. We do not know this; that's the main reason we must abstain from saying so. The other excellent reason is that to affirm it positively is to make too little of human freedom. Doctrine must always guard our free will. At the same time, though, we Orthodox are encouraged to hope that in the end, somehow, by Christ of course but in ways unrevealed to us, all will be saved. So let us hope. But in the end, as Rob Bell also says, the real, sometimes terrifying, question we need to ask is, "What do I want?" Because I'll get it. That bit is for certain. What do I really, at the deepest abyss of my heart, truly want? Finally my slow brain noticed, upon of all places, the main door of the library, a small sign, "Free WIFI"!!! So now I have brought my laptop to the library and plugged it in, and voila! It works, and both gmail and my blog are fully functional on it. Hooray!! Here, they are known simply as, "London 2012". Team Great Britain is currently 3rd in the medals tally, behind China and the US. However, you'd never know the Brits weren't virtually the only team in the Olympics. We've never seen any competitions in which there was not a British contender for a medal. Although I know I could look it up on the Internet, I have no idea who, among the Americans or the Chinese has won any medals for anything. We mostly see the sports at which the British mostly excel: equestiran events such as dressage and jumping; water sports such as rowing, sculling, sailing, swimming, cycling races. The medalists here receive more adulation than American medalists do. The BBC, instead of using the air time to show another event, spends a lot of time interviewing these athletes and talking to supporters in their home towns and so forth. Even Vladimir Putin's visit to 10 Downing Street got virtually no press coverage. It was simply mentioned that he was here and that Syria was most likely on the agenda. There wasn't even a press conference afterwards. To my delight, the Dales are exactly as I had imagined them. See a lot of images here. They are wide-open, grassy highlands, sometimes quite craggy hills, foothills, in fact, of the Pennine Mountains, dotted with sheep and the occasional tree. There are wide, shallow, rocky rivers and streams. There are stone stiles, barns, churches, and crofts hundreds of years old, as well as the occasional castle. There are villages right out of a story book, cobbled streets and all. In summer, the Dales are a vast, wide-open, sun-drenched, clear-aired, desolate playground for hikers and bikers and other holiday-makers; in winter they must be terribly cold, though, and bleak. Our first stop was Hornby, on the edge of the Dales, where, spotting its castle, we hoped to tour it. Unfortunately, one cannot tour it, as the family that owns it is still in residence there. We toured the quaint church instead, then went on to Ingham, and from there to Hawes, a gorgeous, scenic drive through sunshine and high hills and sheep and grass. A nice surprise awaited us in Hawes: it turns out to be where our favorite English cheese is made. The Wensleydale Creamery is open to visitors. So we got to see how the cheese is made and to taste about 25 varieties of it. A craft fair was in progress, and Demetrios, having been snappish to me while we were parking, couldn't regain his peace without buying me something. We settled upon a pair of beaded earrings he spent 20 minutes choosing. (If you know Demetrios....) They are lovely, peridot colored crystal; I’m wearing them as I type. From Hawes we drove on to Leyburn, another picture-postcard village where we found a Chinese restaurant and enjoyed for supper some of the best Chinese food I’ve ever eaten. Although there isn’t much to tell you about this adventure, as most of it consisted of scenery, yet there was very, very much to enjoy. It was one of our best ever days out. It was only a taste of the Dales; another time when we can afford it, we'd like to spend much longer there. Martin Mere is a wetland, a wild bird preserve. Although it’s quite near us, we never got there before, for lack of a car. This time, we went there with Margaret and her daughter, Lizzie. Margaret is a nurse who used to work with Demetrios back in the mid-sixties and I think she’s 92 or something like that, now, with her mind entirely intact. She even remembers nursing the soldiers returning from Dunkirk. She’s red-headed and definitely has the firecracker personality stereotypically associated with that, delightful. Her daughter, Elizabeth, is my age. Lizzie is an avid bird watcher, so avid that she carries not only the world’s best binoculars, but also a tripod for holding them. She knows every bird in Great Britain, making her the best guide anyone could ask for to this wetland preserve. Martin Mere has a great lake, marshy spots, artificial ponds, bird nurseries, bird boxes, trees and bushes and perfect spots for a huge variety of birds to live and/or breed. There are paths and several hides. The hides are buildings you go inside so the birds can’t see you. There is a certain etiquette for hides, such as being quiet, closing any windows you open, closing the door after you. Among the ducks, besides the usual Mallards, we saw Eiders, with their wedge-shaped blue beaks and Shelducks, the size of geese, with red beaks and a conspicuous red knob at the base of the beak. We ended up buying me a pair of binoculars, too; I’ve wanted them for a long time. My mom gave me the money for them last year for my birthday. The binocular shop had a large range from which to choose, and despite Lizzie’s resolve to stay silent, I did manage to get her advice; she thinks I ended up with the right pair for me (i.e., for an only moderately avid birdwatcher). We had lunch in the café, and then drove Margaret home, as she tires out by lunchtime. Lizzie, with Margaret’s car, stayed all afternoon. I went home and in my birdbook, marked the birds I’d seen. What do we do all day over here in England, some people wonder? Well, we live here. Mostly. Most days, the weather being somewhat uninviting, Demetrios goes to the library at Edge Hill University and does his reading and writing, working on his book. I amuse myself with my groups, my friends and acquaintances, knitting, etc. But we are always prepared for a fine day. England doesn’t just have fine days. When she has good weather, it’s downright glorious. In summer, we’re nearer the sun than our more southerly neighbors, and the sunshine and blue skies and super-concentrated green of the vegetation make the English countryside radiant. And on days like that, we set out in our new car in search of adventure. You wouldn’t expect the little Liverpool suburb of Crosby to hold much adventure, but we found it there anyway. We went to Crosby because that is where Demetrios stayed the first two weeks he was ever in England. He had been invited here by the family of John Coventry, an English friend he had met in camp. The family were especially kind to him and Mrs. Coventry, in particular, took some trouble to introduce Demetrios to the English ways of doing things. Dr. Coventry helped Demetrios find his first job, here in Ormskirk. That objective accomplished, we next noticed, across the street, a windmill. Well, it was what had once been a windmill, now minus its sails and several stories high. So we thought we should go have a closer look. The windmill was on a green side street, the quiet very surprising, given it was right off the main road. All the houses were very large (by English standards) with gorgeous, lush, colorful gardens. “Millionaires’ Row,” I said. A man walking in the opposite direction to post a letter greeted us and we paused to chat. We told him we wanted to see the windmill. Was the windmill occupied, we asked? We thanked the man and continued our walk down the charming lane, pausing to admire bushes and shrubs and the lavish flowers – and enormous houses. We had gotten most of the way down the lane when the same man, returning from the mailbox, overtook us. “Here,” he said, “have a look at my house.” He swung open a pair of massive, wrought-iron gates with gilded knobs and finials, to admit us to about an acre of garden, its most prominent feature a full-size tennis court. We oohed and ahhed over the garden and that appears to have encouraged him to invite us inside. The living room was amazing, an enormous room that fulfilled every stereotype of affluent English living 75 years ago. It was full of big, overstuffed furniture and had a very high ceiling and tall windows dressed in heavy and elaborate drapery and swags. We were amazed, and the man quickly realized it. “Million and a half,” he said. That seemed to have cleared up the misunderstanding, but the man, Robbie, showed us around the rest of the ground floor anyway, both to be polite and because he was so proud of it. The dining room, an extension of the living room, comfortably contained a dark dining table that could easily seat 16, and at least that many chairs with it. Past the dining room and the proper staircase was – are you ready? – the pub. Yes, it was a complete pub with a bar, well-stocked, including connections for the casks of beer and the levers you pull to fill the pints. There was even a dartboard. But the pub’s main feature was the biggest billiard table I have ever seen. There was a brass gizmo on the wall with sliding tabs for keeping score, and around the room were signed photographs of all of England’s greatest snookers players. “They come here for the professional size table,” said Robbie. “You don’t find that in so very many places.” He then regaled us with stories about several of them and how he had met them. But the wonders of the house were not yet finished. Past the pub was an indoor, heated, lighted, swimming pool, complete with changing room. Robbie explained that he and his wife were separated, and although it now seemed likely then would soon be back together, they definitely wouldn’t live in this house. The boys were now grown up and the place was far too big for only two, and he really would sell it. I really might have bought it, too! If I were as rich as Robbie. And how had Robbie made his money? Well, he ad begun literally shoveling coal into hoppers. He’d had various other similar jobs before going into used cars. And from there into buying and fixing up and selling houses. Why aren’t we all millionaires? If Robbie can do it, so could we all, in theory. Then he inquired where we were headed next, and we said to Formby, to see the beach. He said we ought to check out the iron men closer to here before continuing to Formby. Iron men? We had never heard of them. They’re sculptures of men, three of them, wading out into the surf. You can see a lot more of a lot less of them, depending upon the tides, as they are quite dramatic around here. So off to see the iron men we went, stopping en route at a charming pub for some lunch. The iron men, well, looked just like men; more interesting were the houses at the waterfront, ranging from quintessentially traditional English to art deco. Lots of fun. By time we got to Formby, it was time to stop again for a bit of refreshment, so we had afternoon tea in a delightful little shop, newly opened, and oriented mostly to children, birthday parties and so forth. I had my first Victorian Sponge Cake, a yellow cake with clotted cream and jam in between the layers. Yummy! The waitress, a friendly young lady who quite delighted us, told us how to get to the beach, telling us the route lay through a squirrel preserve. Squirrel preserve? The very idea sounds strange in American ears, doesn’t it? We so often consider squirrels a nuisance. But it seems that here, the Red Squirrel is threatened by the more aggressive Gray Squirrel. So this preserve has been established for the Red Squirrel. You walk about half a mile through it, and then you come out into a desolate landscape containing nothing but sand dunes as far as you can see, sand dunes capped with vegetation and full of birds, the only ones of which I recognized were starlings and magpies. It was beautiful in a wild sort of way. It’s a fabulous place, laced with trails, good for jogging, flying a kite, running around, playing hide and seek, and having fortresses. (You don’t have to built one; each separate dune is one already.) We saw all of these things going on, yet so large was the area that it still seemed all but deserted. You walk a full mile, more like a mile and a half, before you catch sight of the Irish Sea beyond the last dunes. Then of course there are two miles to hike back to the car. We reached our car in the late evening, time to head home, tired but exhilarated. The drive was only 25 minutes. It’s the people you meet make outings into adventures.